provided by open access journals. In order to select a suitable open access journal in which to publish, it can be helpful to understand what it is that you are paying for with your publication fees. In this context, we find it useful to think about the economics of scholarly publishing. Academic journals require one or more revenue streams to cover their costs and turn a profit. There are three basic sources of revenue to which a publisher can turn: (1) publication fees, (2) sponsor support, and (3) subscription charges. Publishers regularly employ each of these sources, sometimes in combination. For example, Proceedings of the National Academy of Sciences USA (PNAS), charges authors by the page and charges subscription fees to university libraries. The PLoS family of journals charge publication fees, and receive grant funding from agencies including the Sloan foundation and the MacArthur foundation. Open access has increased in popularity over the past decade but at present the majority of scholarly journals still require paid subscriptions for access to their content. In particular, most journals produced by for-profit publishers derive all of their revenue from subscription charges. As a result, authors in just about any field of scholarship will have numerous venues in which they can publish for free. Yet for decades authors have been willing to pay page charges to society-published journals and, more recently, publication fees (sometimes called article processing charges or APCs) for open access. Some authors do so because of a desire to support their scholarly societies or from a commitment to the principles of open access publishing. Beyond these ideological motivations, there are additional important incentives. To keep matters simple, here we will focus on two: prestige and readership. Prestige. The competitive peer review system used by the majority of scholarly periodicals serves to certify the novelty, interest, and quality of academic publications. As we all know, a record of publications in the top tiers of the journal hierarchy has a critical impact on hiring, promotion, tenure, merit, and funding decisions. Readership. To have a significant influence on scholarly thought, one needs to be read widely by one\'s peers. Journals vary widely in readership; researchers often conscientiously follow the publications in top journals, while turning to lower-tier journals only in pursuit of specific references. Of course prestige and readership are not independent of one another. Journals become prestigious in part because they are highly read, and prestigious journals are highly read in part because their prestige allows them to attract the top papers in a field. When you pay open access publication fees, not only are you paying to make your work freely available to anyone in the world--you are also paying for the prestige and the readership that you will gain by publishing in a particular journal. When choosing among alternative venues, you would like to get as much possible for your money. Our aim with the Eigenfactor Index of Open Access Fees is to help you do just that. In order to quantify what you get for your publication fees, we note that both prestige and readership translate into scholarly citations. In particular, we expect that authors will be interested in the relative number of citations that their work is likely to receive in a given journal. We measure this quantity as the Article Influence® score of the journal (AI). Of course, authors with larger research budgets may be willing to pay more to attract additional citations, but with all else equal, we imagine that authors would prefer venues with higher Article Influence scores and lower costs over venues with lower Article Influence scores and higher costs. We provide this information for the major open access journals, and within each research area we list open access publications ordered from the most to the least cost effective with respect to publication fees. At present we are able to compute Article Influence scores only for those journals listed in the 2010 Thomson-Reuters Journal Citation Reports (JCR). While this list includes over 10,000 total publications and 761 open access publications, some newer open access journals and many lesser-known ones are not included in this list. We have tried to provide partial information for these journals where possible, though potential authors may wish to think carefully about the prestige and readership to be gained from publishing in journals not included in the JCR. Our methods, and some results from stastical anlysis of open access author fees, are described in detail in West et al. 2014. Article Influence scores are derived from the Thomson-Reuters Journal Citation Reports data using the Article Influence® algorithm. We will continue to add open access journals to our database and update prices and Article Influence scores, as they become available. We also note that our sample is not representative of the full set of peer-reviewed OA journals, even though our sample is representative of the minority that charge publication fees. Open access journals labeled "nonISI" are open access journals not listed in the Journal Citation Reports (2011). When shopping for a journal in which to publish your work, you can choose your academic discipline from the drop-down menu and then center the cross-hairs on a candidate journal. 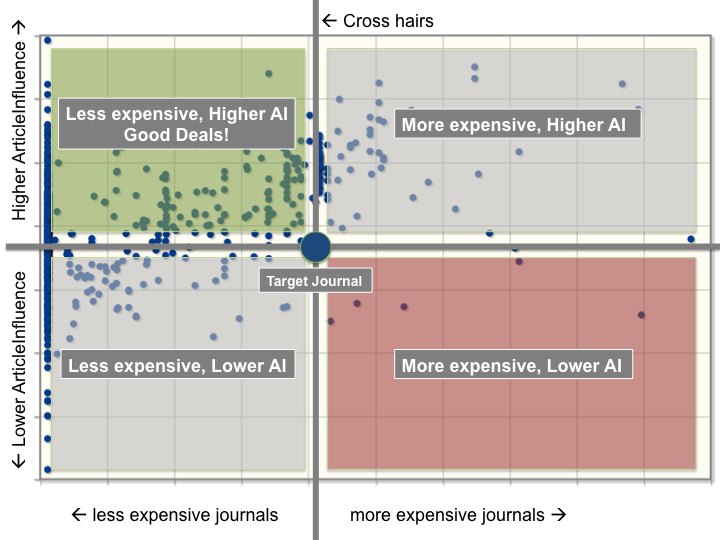 Any journals that appear above and to the left of the cross-hairs "dominate" this journal in the sense of having greater influence and costing less.